Daryl Quitalig - For Shaw Media Huntley running back Carter Beaudette (34) runs the ball 33 yards for a touchdown in the second quarter of the football game at Huntley High School Friday, Oct. 21, 2016. Huntley defeated McHenry, 44-14. 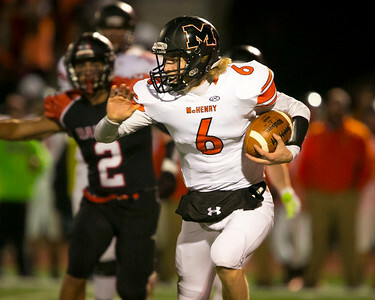 Daryl Quitalig - For Shaw Media McHenry quarterback Colton Klein (6) rushes the ball in the first quarter of the football game at Huntley High School Friday, Oct. 21, 2016. 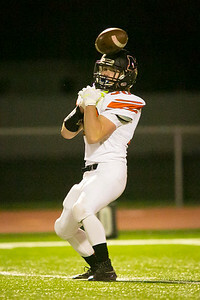 Huntley defeated McHenry, 44-14. Daryl Quitalig - For Shaw Media McHenry kick returner Michael McManus (30) misses a return in the first quarter of the football game at Huntley High School Friday, Oct. 21, 2016. 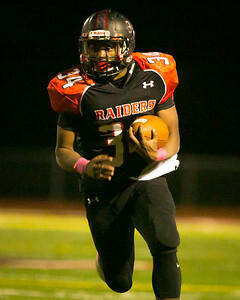 Huntley defeated McHenry, 44-14. Daryl Quitalig - For Shaw Media Huntley defensive back Tyler Koss (24) runs the ball after intercepting a pass intended to McHenry's Aaron Wagner (8) in the first quarter of the football game at Huntley High School Friday, Oct. 21, 2016. 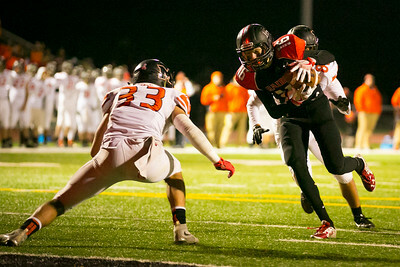 Huntley defeated McHenry, 44-14. 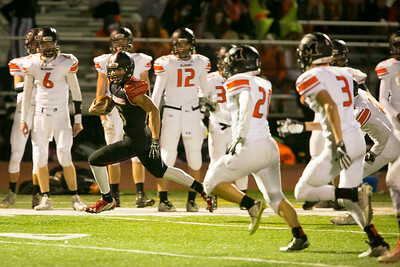 Daryl Quitalig - For Shaw Media Huntley quarterback Eric Mooney (5) runs past McHenry's Agustin Andrade (33) on a 21-yard touchdown run in the first quarter of the football game at Huntley High School Friday, Oct. 21, 2016. 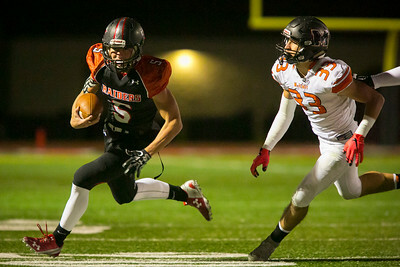 Huntley defeated McHenry, 44-14. Daryl Quitalig - For Shaw Media Huntley quarterback Eric Mooney (5) runs the ball 65 yards for a touchdown in the fourth quarter of the football game at Huntley High School Friday, Oct. 21, 2016. 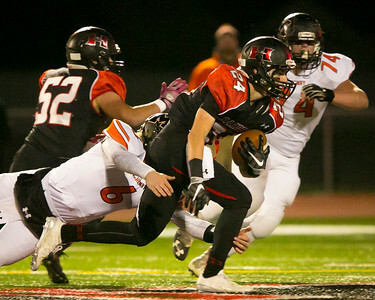 Huntley defeated McHenry, 44-14. 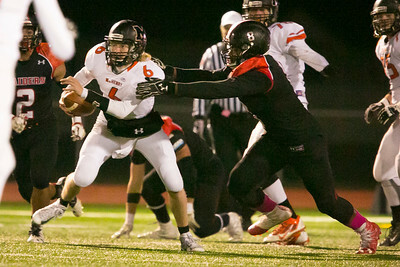 Daryl Quitalig - For Shaw Media Huntley defensive lineman Olalere Oladipo (8) pursues McHenry quarterback Colton Klein (6) on a run in the third quarter of the football game at Huntley High School Friday, Oct. 21, 2016. Huntley defeated McHenry, 44-14. Daryl Quitalig - For Shaw Media Huntley wide receiver Brian O'Mara (16) makes a reception in the second quarter of the football game at Huntley High School Friday, Oct. 21, 2016. Huntley defeated McHenry, 44-14. Daryl Quitalig - For Shaw Media McHenry running back Giovanni Purpura (22) runs the ball in the second quarter of the football game at Huntley High School Friday, Oct. 21, 2016. Huntley defeated McHenry, 44-14. 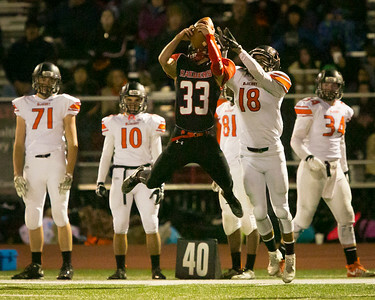 Daryl Quitalig - For Shaw Media Huntley defensive back Ben Stevens (33) intercepts a pass intended to McHenry's Braden Crowley (18) before running 17 yards in the second quarter of the football game at Huntley High School Friday, Oct. 21, 2016. Huntley defeated McHenry, 44-14. 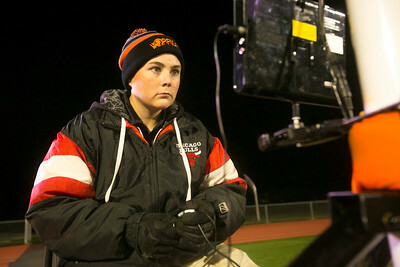 Daryl Quitalig - For Shaw Media McHenry team manager Steven Hensley works an end zone camera during the football game between McHenry and Huntley at Huntley High School Friday, Oct. 21, 2016. Huntley defeated McHenry, 44-14. Huntley defensive lineman Olalere Oladipo (8) pursues McHenry quarterback Colton Klein (6) on a run in the third quarter of the football game at Huntley High School Friday, Oct. 21, 2016. 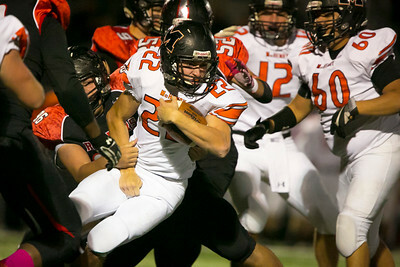 Huntley defeated McHenry, 44-14.